Well, as a kid everyone had his or her favorite childhood superhero, I was a little different. I remember the first time I watched the TV series ER, I couldn’t have been older than 6 years old. I was so amazed when the characters in the show came to see the doctors because they were sick and the doctors were able to fix them. That captured my attention. The difference between them and a “superhero” was that they were so real, like you and me. They had a sense of humanity that I appreciated. From that day on, I knew I wanted to be a doctor. As I grew up, the love for medicine never left. 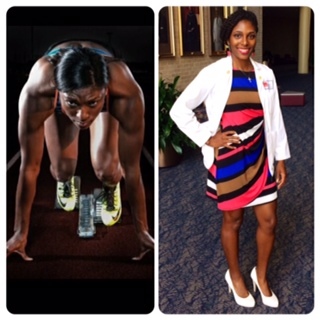 Even though I was a track athlete for many years, I always knew that medicine would be my final career. My major in college was Neuroscience. I would say it prepared me for medical school in that it was a subject that gave me exposure to a higher degree of learning in its complexity and abstract views. Did you ever consider giving up on your dream? What obstacles or hurdles did you have to overcome in your medical school journey? As a D1 student-athlete, it was tough balancing school and Track. I was on a full athletic scholarship at Tulane University so ultimately Track was my job and came first before my studies, in many cases. We traveled every weekend to compete, had early morning weight sessions and afternoon practices; if we didn’t perform to the level that was needed or did not attend practices, those discrepancies were terms for a reduction of scholarship or removal from the program. I couldn’t afford to lose my scholarship so my main focus was my bread and butter, which was track. It was not a 50/50 deal, track was 70% and school was 30%, at least that’s how it felt. There were many times I had to face people that would discourage me from pursuing a pre-medical degree because “there was no way, as a student-athlete, I could obtain the grades I needed to be accepted into medical school.” I was looked at as simply a jock, all talent and strength but not the smarts to be a successful doctor. I do admit there was a struggle with keeping grades up and there was even a few hiccups in my academic career but the more people doubted me, the more I pushed for it. I enjoyed the challenge and I enjoyed the fact that when I finally got accepted it was a surprise to others. You went from being a professional athlete to a medical student, can you tell us more about that journey? Going from being an athlete to a medical student was definitely rough. My life has been surrounded by Track and Field, since the age of 11. Everyone around me including my closest friends were athletes. My mindset was train hard, win, gain notoriety from it, and have fun. Professionalism in the sports world is completely different from professionalism in the medical world. You have to be competitive and strong, as well as have a sense of cockiness and attitude as an athlete. It just comes with the territory. So, the first couple months in medical school very uncomfortable. I didn’t know how to act or what people would view as being acceptable, especially being a person of color. I felt like there was a sense of inauthenticity on my part because this lifestyle and environment was not what I was used to. I was way out of my comfort zone and in a shell for a long time. I lost a couple of friends and people in my life that I loved or meant a lot to me because I had to go through the process of finding my new self and accepting the fact that I’m no longer the person I used to be or was known to be; medicine is going to be my life as I know it. But, things definitely got better as time progressed. You also obtained your masters, what was the motivation behind that? The motivation behind obtaining my Master’s was more as an enhancer for my process of getting into medical school. How was the medical school application process for you? The process of the medical application was very long. There are a lot of parts to the application process. It was costly applying to numerous amounts of medical school’s across the country but it was something that had to be done if you want to have a better chance of getting accepted somewhere. What was your first year of medical school like? First year was more of an adapting year for me. The school that I’m attending has a unique program so it was not as stressful as I thought medical school would be. I’m only an hour away from my hometown so I went home often if I wanted to get away. I was able to have somewhat of a life and still workout. The classes contained a lot of info but everything was manageable. I didn’t feel overwhelmed or unhappy about my decision of being a medical student because I loved learning about medicine, so if you love what you do, it doesn’t feel like work. What do you enjoy most about medical school? I enjoy the knowledge that I’ve gained over the past year. I love the fact that you get to be exposed to a lot of common diseases and learn how to dissect them to the level of a diagnosis and then treatment. I also found myself discovering levels to my capabilities that I either never used or knew I had. It’s been a great journey so far. I feel fulfilled with my decision to do medicine. I am currently the Chapter President of the Student National Medical Association. We are an organization that is committed to supporting minorities in medicine of all ethnic backgrounds and involved in community service projects serving underserved communities. We also have a Minority Association of Pre-Medical Students program in our organization where we go to local universities and speak to undergrads about the process and life as a medical student. I love the MAPS program because we are able to reach out to students and give them hope and encouragement of being part of this world of medicine. How do you balance your personal time with medical school? I balance my personal time by either going home on some weekends, hanging with my friends, going to the movies or working out. I give myself a set goal in studying and when I accomplish that or feel like it’s been enough I stop and chill out until the next day. Do you have any advice for students considering a career in medicine? If I had to give a piece of advice to students considering a career in medicine, I would say don’t give up! You will be thrown a lot of curveballs, obstacles, doubt, negativity and discouragement but you have to ignore all of it and be strong. Don’t let anybody tell you that you can’t succeed instead let it motivate you. Believe in yourself if no one else will. As a minority in medicine, earn that respect from your peers and authorities by being true to yourself, working hard and being committed to what you love. Thank you for sharing your story Olivia. Very inspiring! Any questions for Olivia? Leave a comment below and she’ll get back to you. Do also check out the other Med Student spotlights! ← Grit: You Better Get You Some! Precious , That is one of the most greatest and uplifting story l have never heard in my life . I love reading these stories, thanks for sharing them! I’m glad to hear! Thank you for reading!